These two MADs (mandibular advancement devices) made by Ripsnore and SnoreMender both work with varying degrees of success. My wife and I slept wonderfully while using the SnoreMender but the bulky and ill-fitting Ripsnore presented many challenges throughout the night. If it is a choice between the Ripsnore and SnoreMender, seriously consider using SnoreMender. You will need to ensure that the fitting process is done correctly with both devices. Understanding several important details about both devices will help you make a decision to suit your needs. 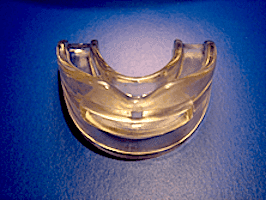 Using technology similar to many MADs, the Ripsnore pushes the lower jaw forward to open your airway. Despite company claims, the Ripsnore has not gained approval from the Food and Drug Administration (FDA), only the plastic that it is built from has. I was forced to wait much longer than most of the other devices for the Ripsnore to arrive. The minute I opened the box, my wife and I could immediately see that the mouthpieces were way too large. After three different tries with the boil-and-bite fitting method, I finally managed a comfortable fit. My wife could not wear the device at all because the bulky size kept making her gag each time she attempted to fit it. The first night did not end up well for me. As a result of the size and awkward structure of the Ripsnore, it kept falling out of my mouth and onto the floor. During the few times that I could briefly get it into place, I drooled all over my pillow. From the time that I started sleeping, it only took two hours for the Ripsnore to move out of place and fall out of my mouth. I woke up in the middle of the night, several times, to rinse it off and put it back in. After the third time, I just left it out. My wife and I were both very tired the next morning after a very poor night’s sleep. I was happy that the cleaning process is very simple but this benefit is minor given the ineffectiveness of the product overall. Using MAD technology, the SnoreMender advances your lower jaw and provides a comfortable fit thanks to the soft, flexible construction. The hinged design means that you can easily open and close your mouth. In addition, the air holes in the mouthpiece allow you to breathe through your mouth. The SnoreMender took four days to arrive after I placed the order. When I first put the SnoreMender into my mouth, I was surprised how comfortable it felt. I realized that this model features Pressure Shift (PS) technology, which redistributes the entire burden of the device to your stronger middle teeth, which makes for a more comfortable experience. My wife snored softly the first few nights though she said she heard no snoring sounds coming from me. My jaw was a little sore but after the third night, the soreness was gone. After the two-week trial, we both were very happy with the SnoreMender. The construction even makes it possible for you to talk normally while wearing it. People with a deviated septum or who have illnesses will prefer the SnoreMender as it allows you breathe through your mouth. Cleaning was a very quick process. The soft, one-piece construction took almost no effort at all. You just need to scrub it with a toothbrush and a little dish soap. The biggest disadvantages to the Ripsnore are the size and the fitting process. My wife would have been significantly less irritated those first few nights if it had a more specialized and comfortable design. Both the SnoreMender and the Ripsnore are equally easy to clean and take very little time. The Ripsnore is uncomfortable and bulky. I recommend that you choose another model that prioritizes functionality and comfort, such as the SnoreMender with Pressure Shift technology. 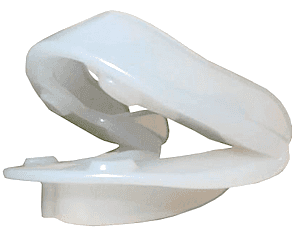 If you buy either snoring mouthpiece, make sure to check out my Ripsnore coupon and SnoreMender coupon pages.